I've been an avid reader all my life, but almost completely stopped reading novels, sci-fi, literature and philosophy books a long time ago. In the 70's and 80's, almost all my reading was either mathematics, computer science or tech manuals (plus a healthy does of reading and grading student papers). Since the 90's, it has been mainly tech, history, economics, politics and more tech. To a great degree, this has been a "book vs. web" thing, but also somewhat related to diminishing eyesight. I have spent a lot of time at the computer over the last 30 years and grown accustomed to reading screens where I can adjust the text size as I like. To some degree, this has also been an attention related issue as I like to constantly switch between many different topics when on the computer (or computers; I'm one of those people that tend to have dozens of browser tabs open at once). It's also a hypertext and yak combing issue. The notion of curling up ...with a good book was something I used to enjoy very much, but had lost it's appeal over time. I thought I no longer had the patience for spending the better part of a day with just one book, especially without my youthful eyes that could handle the fine print and various lighting conditions. But things may be changing, in part due to our travels. First, I started to read a few books on my iPhone and that got me back into the habit of reading novels (and still quite a bit of history). More recently, I discovered a small library of books here in our quaint little hotel on the beach and am enjoying them as much as ever. In fact, I think I like them far more than using any kind of device. There are lots of reasons for this, but mainly a book (especially an old paperback) is, still, just so much simpler to use than any device. Plus I don't worry about losing it, running out of power or being diverted by something else. 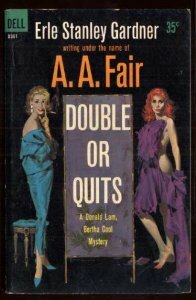 I just read my first Earl Stanly Gardner (not a Perry Mason, but one of the Cool and Lam series he wrote under the name A. A. Fair). Fun LA detective stuff for Noir fans. Pure escapism. Can't wait to find some more of these; there are over two dozen in the series. My good friend Jay Dedman planted some seeds a few years back and I think they have sprouted. I've starting to think about finding some library book sales and flea markets where I can browse for some cheap reads. Thanks Jay.